coming alive in the midst of everyday life. Come to know a freedom and peace too often out of reach in the modern world. Offers on-line retreats using videos, conferences and guides. Also has Ask-A-Priest in which questions are answered. The ability to send in your prayer request to the shrine of Our Lady of Lourdes shrine in France. Lauds (Morning Prayer) and Vespers (Evening Prayer) are the two major hours of each day, providing an opportunity for prayer and dedication before starting work and prayer and thanksgiving afterwards. Compline (Night Prayer) is designed to be said last thing at night. It is short and simple. Indeed, it can be made even shorter and simpler by using Compline for Sunday night on every night of the week - in which case it can be learnt by heart and recited from memory. The Office of Readings is designed for any time of day. As its name implies, it has two long readings in it: one from Scripture and one from the Fathers of the Church. Terce, Sext and None are known collectively as the "Little Hours" (or, more respectably, as the Daytime Hours). They are quite short, and intended for use during breaks at work. 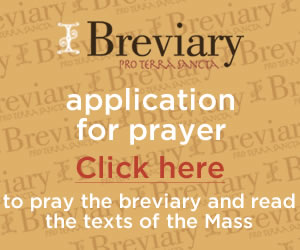 This website will provide the user the opportunity to pray the Liturgy of the Hours for each. You can also obtain an app for your tablet or i-phone or android to enable to do this prayer and more at no cost. Pray as you go is a daily prayer session, designed for use on portable MP3 players, to help you pray whenever you find time, but particularly whilst traveling to and from work, study, etc. ChurchYear.Net hosts many free prayers and the amount is growing daily. We have compiled many of our prayers into this one site, with prayers for Catholics and other Christians of all types. In today's virtual world, you don't need a regular prayer book, so come here, to this online prayer book page to get started, and find all the prayers you need for any occasion. Discerning Hearts is dedicated to evangelization and spiritual formation through new media. Discerning Hearts creates engaging multi-media, specializing in audio productions (known as podcasts and radio broadcasts) faithful to the teachings of the Roman Catholic Church and it’s rich authentic spiritual tradition. Its mission responds to the Church’s call to use the media for evangelization, catechesis and spiritual renewal. How to Pray the Rosary Everyday.com helps to restore Catholic culture by supporting prayer life; developing a Rosary Community; providing an inviting, peaceful place to pray the Rosary; being completely in line with the Magisterium of the Catholic Church.